Ok, ok. I know, enough with the holiday food! But I’ve got just one more holiday recipe for you, and this one’s good enough (where good = tasty & nutritious) that you can use it all year ’round! This was our family dessert for Christmas Eve (our big holiday meal), and it was a special request repeat of our dessert two years ago: pears poached in cranberry juice, topped with a wee bit of light cheesecakey filling, and a little bit of caramel sauce (the extras from the Dark Chocolate Caramel Truffles) on the side. Yep, delicious. The caramel sauce along with the pears was inspired by my visit to Chez Panisse in December, where I had a persimmon pudding served with poached pears and caramel sauce. Yum. The original recipe comes from Issue 4 of Clean Eating Magazine, where they were the cover photo and recipe. I don’t usually see a magazine recipe and have to make it immediately (except for Jamie’s Puff Pastry Pizzas), but this was one of those recipes — it had to be done right away! 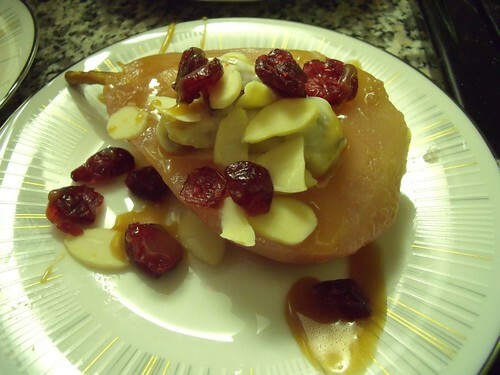 The pears are poached in a combination of cranberry juice and orange juice, flavoured with vanilla and cinnamon. I think this is brilliant. Not only does it give the pears a gorgeous pink hue, but you get the cranberry flavour which helps to complement the pears, and everyone can enjoy them (unlike wine-poached pears or sugar-syrup poached pears, which sometimes scare people away). I think I’m going to make these without the cheesecake filling for weekday dinners and dinner parties. 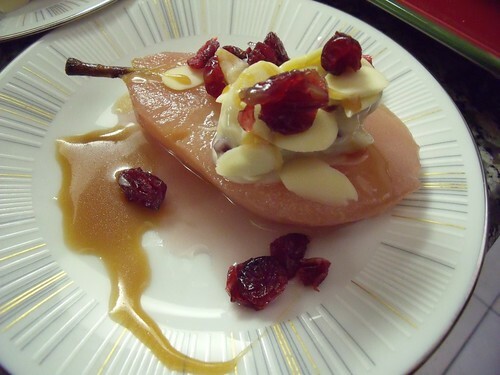 I even enjoyed a couple of leftover poached pears without any of the extra sweet stuff for breakfast last week! If you’ve got vegans at the table, or just want a lighter dessert, you can serve a vegan version of this without the cheesecake filling or caramel sauce, just top with the cranberries and nuts and enjoy! Adapted from Clean Eating Magazines’s Low-fat Cheesecake Pears (Issue 4), Serves 10 people with 1/2 a pear each as a light dessert, or 5 people with 1 pear each as a more filling dessert — I always poach as many pears as there are people and enjoy the leftovers! Optional: Caramel Sauce topping – recipe in Dark Chocolate Caramel Truffles or your favourite caramel. 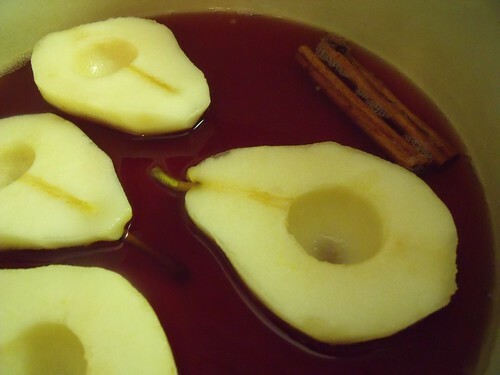 You will only need about 1/4 c.
Begin by poaching the pears: In a really large pot (shallow and wide is better here), combine cranberry & orange juice, orange zest, cinnamon, and vanilla. Peel the pears, and halve them lengthwise — keep the stems where you can, they look so pretty. Core them with a melon baller. If you cut a slice off of the outside edge (opposite where you have just cored them), they will sit flat on the serving plate and make it easier to eat them without having to chase pears around your plate! Add the pears to the pot. Bring the mixture to a boil, then reduce the heat to low and simmer for 20 minutes. In a bowl, mix together all of the Cheesecake Filling ingredients. Set aside until ready to serve. 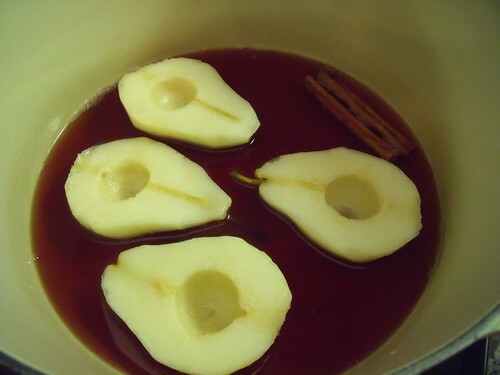 Once the pears are poached, remove the pears from the pot to keep their texture and set aside. You can do all of this in advance, and keep all of the ingredients at room temperature until you are ready to serve. Now comes the fun of plating! 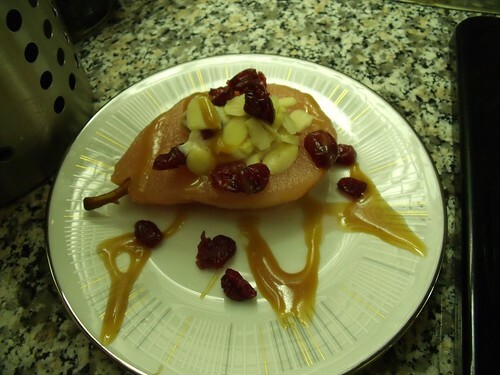 On each plate place half a poached pear, and fill the scooped-out-core with 1-2 Tbsp. of cheesecake filling. Top with extra nuts, cranberries, and caramel sauce if you so desire. Enjoy, feeling virtuous that you’re having a fruity dessert!